Scarborough was yet another one of my short housesits, however, at eight nights it was starting to hit median length for my 2017 records. I was already in wind-down mode in Queensland, with this being my penultimate housesit, divided by a week in my old faithful haunt, the Brisbane City YHA. The small unit at Scarborough was ideally suited for a quiet, relaxing week before heading back into the city, perched pretty much at the absolute tip of the Redcliffe peninsula. From the front gate, there was a road, some parkland, and the bay. Pretty hard to take. Misty the Jack Russell was in that mama bear range of being not too young, not too old. She liked to be around me, but was perfectly happy to keep her own company as well. Though come sundown, the back door was locked because, left to her own devices, she’d be out there chasing down anything that went bump, rustle or squeak in the night. I had plans to explore the area, especially when I read that a ferry service operated from Scarborough Harbour over to Moreton Island. It turned out that it hadn’t started operating yet, so I shelved that idea for next time. So Misty and I just explored the surrounding streets, harbour, Scarborough Beach (on a day I feared we’d both be picked up by the winds and deposited somewhere south of Brisbane). We also stopped in to the bayside cafe and bistro directly opposite the unit where I enjoyed the coffee, and Misty kept a watchful eye on any passing canine traffic. Speaking of traffic, I had a car-less week, but I did take one trip to the shops on the bike. That was a bit of an adventure – I took the smaller one because it had the handy milk crate basket, but that meant my knees were beating a tattoo on my chin throughout the ride! My clients had disappeared to Darwin and beyond for the week, and they got back very late on the night that the Australian Socceroos finally qualified for the 2018 FIFA World Cup. “Where were you on the night we made it to Russia?” On a sofa in Scarborough with a rat dog on my lap! Please Bill, I am a highly trained vermin control canine! Roy and Shirley also want to say thank you very much for caring for me and looking after our home while they were off enjoying themselves. 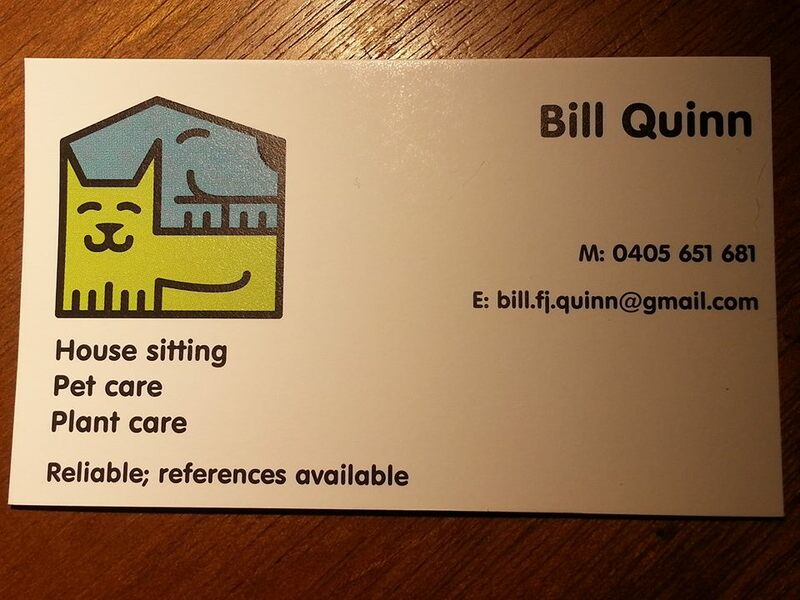 We all recommend Bill the housesitter and hope to see you again.